Last week I discussed how the advertising industry can revitalize itself by focusing on creating commercial content that is compelling in and of itself rather than content that tries to dupe consumers or is designed to be forced upon them. One example of this type of content that I failed to mention is television ads for beer. For years, beer ads have been among the funniest and most memorable of all television advertising, at least for me. With the exception of Guinness, they are all for beer that I don’t drink, of course. I don’t know how many times I’ve thought to myself, if only Summit or Surly or Flying Dog had funny commercials, they might actually influence my purchases. Say Surly, for example, had a funny commercial and Summit and Flying Dog did not; would Surly be more top-of-mind for me as a result? Would I buy more? I’d probably talk about it more with my friends, if only to discuss the commercial. I’ve never understood why brands don’t have their TV ads in place at YouTube at the time they run new campaigns. 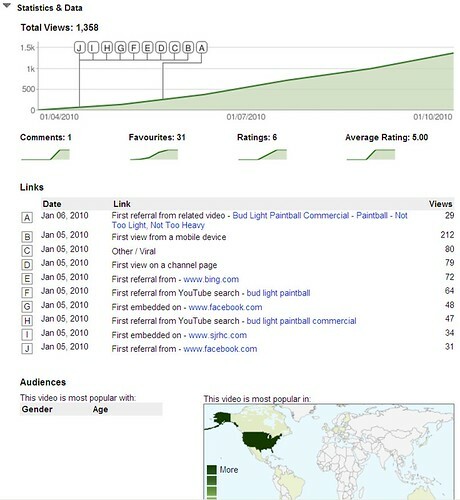 If people see an ad they like on TV, they’ll often search for the ad on YouTube. I did this for Anheuser Busch‘s new Bud Light commercial with the paintball airstrike. Found at YouTube from paintballdiscounters. Hilarious! When I first saw it, I searched YouTube and couldn’t find it. I waited a few days and I could only find crappy versions of it that people had uploaded from their Android phones. I wanted to share the commercial with my networks but I wanted a quality version to share. It was only until this weekend that I found a version that was good enough (and even this version wasn’t very good) to share and this version was not uploaded by Anheuser Busch. 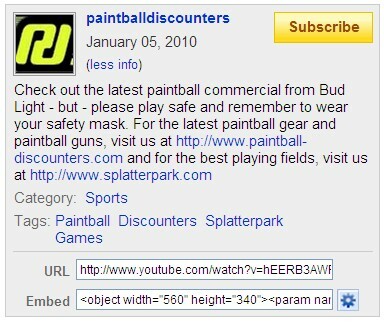 It was uploaded by Paintball Discounters with the deliberate purpose of hijacking interest in the Bud Light commercial to build awareness of their paintball supply site among their target audience. The video is linked to Paintball Discounters‘ paintball supply ecommerce site as well as a link to Splatter Park, a paintball facility in Ohio. It’s a wonder far more retailers do not take advantage of this tactic. If I were a liquor store, I’d establish a YouTube channel and compile all the beer- and liquor-related videos I could find and create playlists. I’d create a Facebook page and a Twitter feed through which to share these videos and engage with beer lovers. It’s even more of a wonder that the big brands aren’t consciously extending their television advertising distribution by uploading quality versions of their ads to enable retailers, customers, and anyone else to spread the brand love. But then, they haven’t asked me.